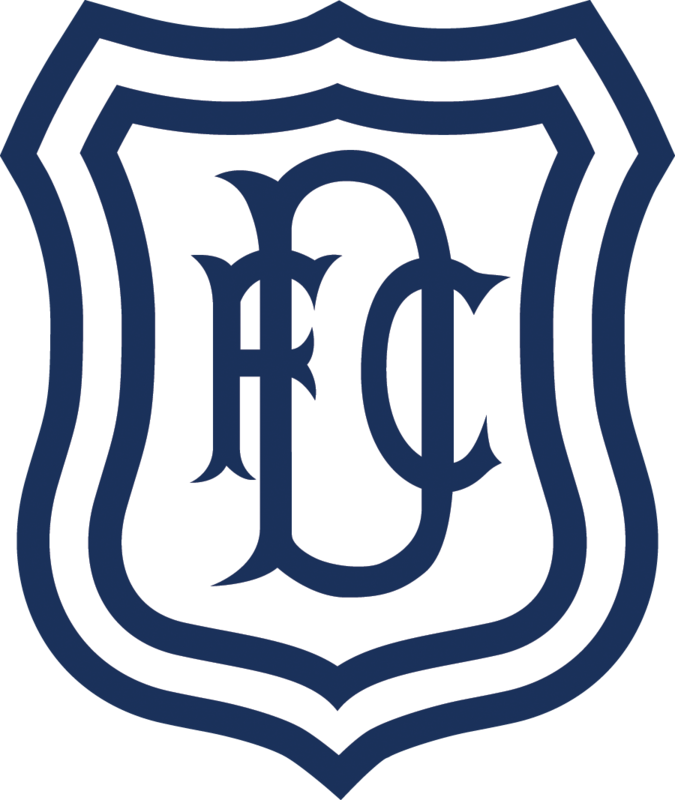 Celtic were too strong for Dundee in the lunchtime Boxing Day match at Dens Park. James Forrest and Leigh Griffiths gave Celtic a 2-0 lead at half time and the champions controlled the second half to take a comfortable win with no further goals. The Dee fielded the same line-up that started against Partick and Motherwell. Celtic made three changes; James Forrest, Callum McGregor and Leigh Griffiths came in for Scott Sinclair, Stuart Amstrong and Moussa Dembele. After kicking off, attacking the end with their own fans in the Bob Shankly Stand, Celtic pushed forward and barely allowed the Dark Blues out of their own half until they scored after seven minutes. James Forrest had already fired Jonny Hayes’ cross from the right against the post and within a minute Celtic performed a mirror image of that move on the other side. Tierney raced into the penalty area and this time FORREST stabbed the low cross past Parish. Celtic continued to dominate and Hayes went close with a header at the far post after a good run and cross by Forrest on the left. Hayes’ game didn’t last much longer; he was stretchered off after he and Josh Meekings challenged for the ball on the half way line. Meekings couldn’t play on either and he limped off, to be replaced by Darren O’Dea. 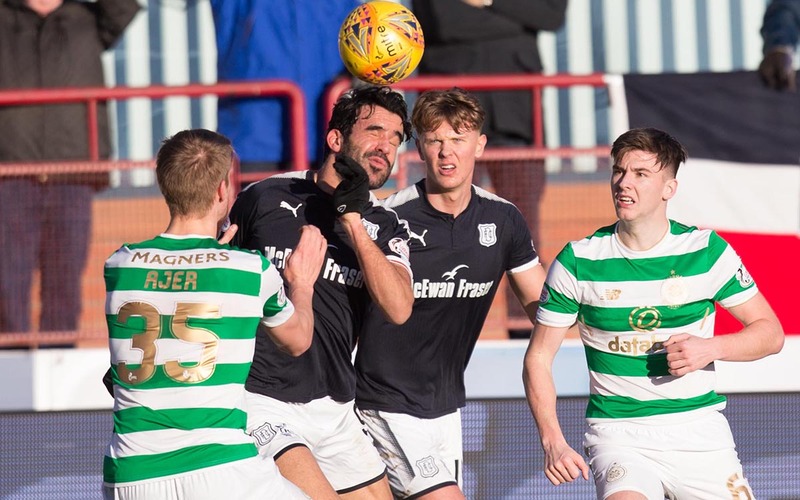 The nearest Dundee came to a chance in the first half was when Faissal El Bakhtaoui’s cross found Mark O’Hara, who was about to shooot only for the referee to stop play so that Hayes and O’Hara could receive treatment. Apart from that Dundee struggled to play their way into the Celtic penalty area. The Dee did succeed in creating space on the right by pulling Kieran Tierney infield to cover A-Jay Leitch-Smith and Mark O’Hara. However, the Dee couldn’t exploit that space to create any real danger to the Celtic goal. Celtic were always far more dangerous on the attack. A slack backpass by Darren O’Dea was picked up by Leigh Griffiths, but Elliott Parish managed to force him wide and the ball ran out of play. There was no denying the former Dee late in the first half when Celtic broke quickly and Olivier Ntcham’s pass allowed GRIFFITHS to run through and score with a rising shot past Parish. In the seven minutes of added time at the end of the first half Celtic twice went close to adding to their lead. 18 year old Michael Johnston had replaced the injured Jonny Hayes and he showed his talent with a fast, skillful run in from the left but Parish saved with his feet. Parish then pulled off an outstanding save to keep out a Forrest shot at the end of a quick series of passes that opened up Dundee. With a two goal lead and firm control of the game Celtic had few problems seeing out the match. Dundee tried hard but never managed to unsettle Celtic, who were able to cruise through the second half. Celtic were content to keep possession and choose their moments to attack. They always looked as if they could step up a gear if they needed to. The Dark Blues had a chance when O’Dea got his head to Jon Aurtenetxe’s freek kick, but sent his effort well over the bar. Celtic were much the more dangerous side, however. Darren McGregor ran through the middle before skying his shot horribly from the edge of the penalty area. Leigh Griffiths sent a low ball across the face of the goal that missed everyone. 18 year old Jack Lambert came on for his first appearance, replacing El Balhtaoui. Dundee had a short spell of pressure midway through the second half, but Celtic’s defence stood firm. Leith-Smith went down under a challenge by Dedryck Boyata, but the unsuccessful penalty appeal looked optimistic. Paul McGowan sent a 20 yard shot a foot over the bar, and Sofien Moussa failed to get his header on target when he sneaked in at the back post on the end of an Aurtenetxe free kick. Matty Henvey, at 17, became the second teenager to make his debut for the Dee when he came on for Leitch-Smith. Without having to force things Celtic remained much the more dangerous side. James Forrest ran through some unusually diffident tackles before pulling his shot yards wide and Michael Johnston volleyed too high from a Forrest cross. Celtic had far too much experience and skill at game management to give the Dee even a sniff at a comeback and had the points tucked away in their hip pocket long before the end. Celts’ skipper Scott Brown might not be hugely popular with opposing fans, but no-one can deny his ability to run a game. As so often, he managed proceedings from the middle of the park and Dundee could not ruffle his composure. The Dark Blues were disappointing in midfield today, and gave the ball away far too often. In the face of Celtic’s pressing Dundee repeatedly conceded cheap possession. 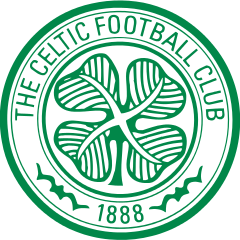 Playing Celtic presents a tough challenge and it becomes almost impossible if the players are not at their best. Sadly that was the case today. Unused subs: Ferrie (gk), Holt, Waddell, Curran. Booked: Moussa (foul on Ajer). Unused subs: De Vries (gk), Bitton, Simunovic, Armstrong, Dembele, Edouard. Goals: Forrest (7), Griffiths (42). Booked: Boyata (foul on El Bakhtaoui), Brown (dissent). Referee: Kevin Clancy. Assistants: Gary Hilland, Joseph Lawson. Fourth official: Stephen Finnie.